Summary: The narrator has a new neighbor, a girl named Zola. Their mothers have already met and decided the two kids should be friends. 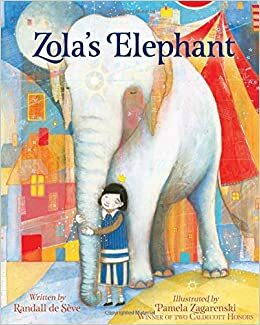 The narrator is sure Zola already has a friend–an elephant–because she saw a big box being moved into the house. She imagines Zola eating toast with her elephant, playing in the bathtub with him, and enjoying a game of hide-and-seek together. 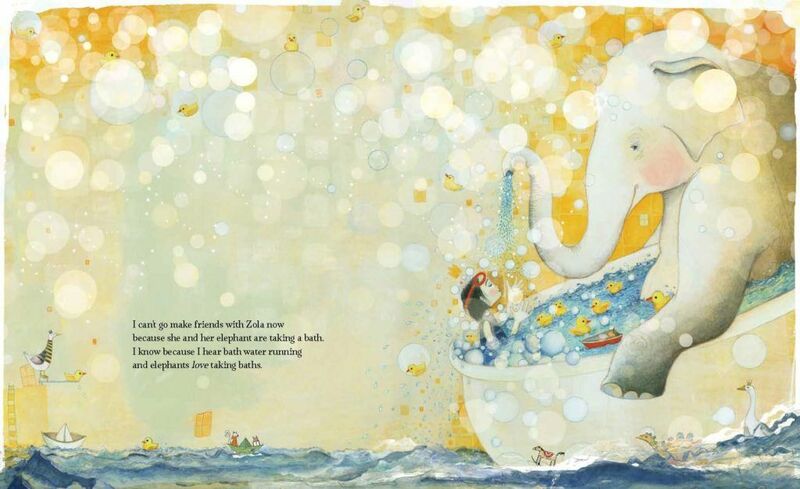 After each page showing what she’s imagining, the illustrations show what’s actually going on at Zola’s house: she’s eating toast alone, washing dishes, then kicking her heels against the wall, bored and lonely. Finally, the narrator gets up the courage to knock on Zola’s door. Together they watch the couch getting unpacked from the big box, then sit on it together as a new friendship is born. 40 pages; ages 4-8. Pros: The author and illustrator show kids how to overcome their fears and reach out to new friends. Caldecott honoree Pamela Zagarenski’s colorful and imaginative paintings give readers plenty to savor. Cons: The narrator’s clown-like costume is a little creepy.